American sterling silver large Bon Bon server by the Whiting Manufacturing Company, pattern 5740, c.1890. This ornate, Art Nouveau server has as high relief, curved floral handle and a large, pierced intricately intertwined scroll bowl with a floral center. Truly the nicest Bon-Bon Server we have ever had, this beauty is 11" long, with a deep bowl 5 3/4" wide and 5" long, weighing 254 grams or 8.1 ozs. Troy. 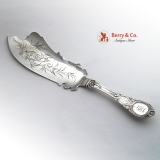 It has an ornate, period script monogram on the back of the handle: ECMcD. Monogrammed as described above, the soft, warm, original finish is present, with no buffing or machine polishing. The excellent original condition and clear detail, with no removals, repairs or alterations, make this an especially attractive offering. 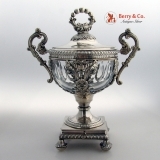 Austor-Hungarian Czech figural open salt dish Assay mark for 13 Loth or 813 Standard Silver, Prague 1820 and Prague Tax Mark, Maker′s Mark Câ€¢D, with all marks clearly struck under the base. The full figured comely lass is balancing the parcel gilt bowl on her head while standing on a circular pedestal mounted on a spread leaf stippled background circular base. The bowl has a reeded rim and a narrow band of crosshatch and pearl decorations just under the rim. Weighing 144 grams, this very desirable, figural pedestal salt is 4 1/4" tall, 2 1/2" in diameter at the bowl and 2 15/16" in diameter at the base. The soft, warm, original finish is present, with no buffing or machine polishing. The excellent original condition and clear, crisp detail, with no monograms, removals, repairs or alterations, make this an especially attractive offering. American sterling silver and parcel gilt serving bowl by the Whiting Manufacturing Company, c.1885 having a wide band or high relief Repousse multi-floral decorations and a fluted under-body, with the interior of the under-body being gilt. This ornate and heavy bowl is 9 1/4" in diameter, 4" tall and weighs 551 grams or 17.7 ozs. Troy. The soft, warm, original finish is present, with no buffing or machine polishing. The excellent original condition and clear, crisp detail, with no monograms, removals, repairs or alterations, make this an especially attractive offering. American sterling silver trumpet vase in a Blossom pattern designed by Alphonse LaPaglia and executed by International Silversmiths, c.1950. This spectacular Art Deco style vase has a cut out Blossom base neck and the trumpet vase sits on a ball and semicircle and small ball support. Weighing 630 grams or 20.3 ozs. Troy, this stunning vase is 9 1/4" tall and 4" in diameter at the rim, 4 1/8" in diameter at the base. The soft, warm, original finish is present, with no buffing or machine polishing. The excellent original condition and clear, crisp detail, with no monograms, removals, repairs or alterations, make this an especially attractive offering. 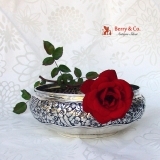 German 800 standard silver floral Repousse footed bowl retailed by Heinrich Maass, c.1890 - 1910. This elegant and useful hexagonal bowl has a nicely detailed applied Repousse rim and sits on a raised circular foot having a band of floral Repousse decorations. Weighing 472 grams or 15.2 ozs. Troy, this handsome bowl is 10 3/4" wide and 3" tall. The soft, warm, original finish is present, with no buffing or machine polishing. The excellent original condition and clear, crisp detail, with no monograms, removals, repairs or alterations, make this an especially attractive offering. American Arts & Crafts 4 piece Coffee Set consisting of a coffee pot, creamer, sugar bowl, and a round tray. Made by Porter Blanchard, c.1960. 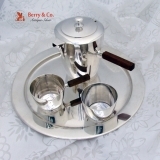 This elegant set measures: the pot is 7" tall, 9" across the handle, the creamer is 6 1/4" across the handle, 3 1/2" in diameter, 2 1/4" tall, the sugar bowl is 3 1/2" in diameter, the tray is 14 1/4" in diameter; Total silver weight is 2181 grams or 70.1 ozs Troy. The excellent original condition and clear, crisp detail, with no monograms or removals, repairs or alterations, make this an especially attractive offering. 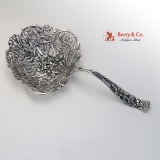 American sterling silver ornate open work basket with a swing handle, grape, cupid shooting arrow decorations. Retailed and possibly made by Rodgers & Krull of Louisville, Kentucky, c.1900. This beautiful basket is 8 1/2" long, 6 3/4" wide and weighs 527 grams or 17 ozs Troy. The excellent original condition and clear, crisp detail, with no monograms or removals, repairs or alterations, make this an especially attractive offering. The pictures truly do not do justice to this special basket. 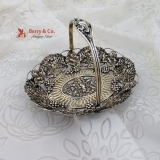 American sterling silver large ornate bread tray in the Repousse pattern by Stieff. 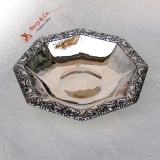 This beautiful tray is 17 1/2" long, 8 1/4" wide and weighs 649 grams or 21 ozs Troy. Monogrammed RES in an ornate period script. The excellent original condition and clear, crisp detail, with no removals, repairs or alterations, make this an especially attractive offering. 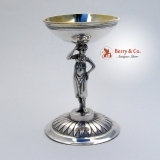 American sterling silver covered trophy cup with embossed wreath decorations by Gorham Silversmiths, c.1910. 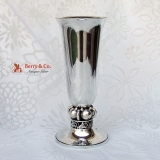 This beautiful trophy cup is 14" tall, 9" across the handles and weighs 1297 grams or 42 ozs Troy. Monogrammed EDO in an ornate period script. The excellent original condition and clear, crisp detail, with no removals, repairs or alterations, make this an especially attractive offering. 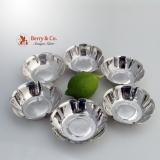 French sterling silver set of 12 Antique chargers with an applied wave edge rim, c.1890. These elegant chargers are 9 1/2" in diameter and weigh a total of 4822 grams or 155 ozs Troy.Each of the plates bears a Royal crest. The excellent original condition save for some minor surface scratches consistent with age, crisp detail, with no monograms or removals, repairs or alterations, make this an especially attractive offering. Danish sterling silver tray, design #1146C by Piet Hein. 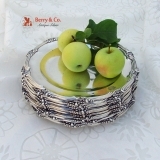 This elegant tray measures 16" x 12" (40.5cm x 30cm) and weighs 1264 grams or 41 ozs Troy. The excellent original condition and clear, crisp detail, with no monograms or removals, repairs or alterations, make this an especially attractive offering. American sterling silver 72 piece flatware set in the Oslo pattern by Porter Blanchard, c.1940. 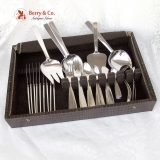 This elegant set consists of: 9 Knifes solid silver handles 9 1/4"; 9 Forks 8"; 9 Salad Forks or Dessert Forks 7"; 9 Dessert Spoons 7 1/4"; 9 Teaspoons 6 1/4"; 9 Butter Spreaders 5 3/4"; 9 Demitasse Spoons 4 3/8" 2 Pcs Large Salad Serving Set 10 1/4"; 1 Serving Spoon 9 1/2"; 1 Berry Spoon 9 1/2"; 1 Pie Server 9 3/8"; 1 Lemon Serving Fork 5"; 1 Gravy Ladle 6 3/8"; 1 Sauce Ladle 5 3/4"; 1 Sugar Spoon 6 1/4"; Total weight is 4108 grams or 132 ozs Troy. The excellent original condition and clear, crisp detail, with no monograms or removals, repairs or alterations, make this an especially attractive offering. Danish sterling silver 52 Piece flatware set in the Tjorn pattern by Dansk Silver, 1968. 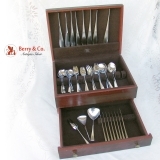 This elegant set consists of: 8 Knives 90 degree twist handles 8 1/2"; 8 Forks 7 5/8"; 8 Salad Forks 7"; 8 Soup Spoons 7 1/2"; 8 Teaspoons 6"; 8 Butter Knives all silver 6 1/2"; 1 Serving Spoon 7 5/8"; 1 Gravy Ladle 6 5/8"; 1 Serving Fork two tine 7 1/2"; 1 Sugar Spoon 5 1/2"; Total weight is 2127 grams or 68.4 ozs Troy. The excellent original condition and clear, crisp detail, with no monograms or removals, repairs or alterations, make this an especially attractive offering. 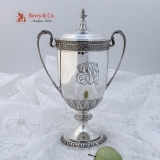 American coin silver Repousse napkin ring having 4 Repousse floral and foliate panels separated by columns and a central panel of an oval stylized shell bordered blank cartouche flanked by small flowers, all set on a stippled background. 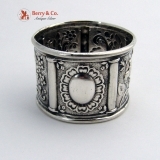 Weighing 24 grams, this unusually attractive, ornate napkin ring is 1 7/8" in diameter and 1 3/8" tall. The soft, warm, original finish is present, with no buffing or machine polishing. The excellent original condition and clear, crisp detail, with no monograms, removals, repairs or alterations, make this an especially attractive offering. American sterling silver fish serving set in the Moresque pattern by Johann Rudolph Wendt of New York City, c.1873, having an ornate, period script monogram on the front of the handle: MHC. Both of these fabulous servers have engraved Aesthetic designs and fish on the bowls and tines. The serving fork is 9 1/8" long and weighs 103 grams. The cut work fish knife is 12" long and weighs 131 grams. The total weight of the set is 234 grams or 7.5 ozs. Troy. The set was retailed by James Allan of Charleston South Carolina. Monogrammed as described above, the soft, warm, original finish is present, with no buffing or machine polishing. The excellent original condition and clear detail, with no removals, repairs or alterations, make this an especially attractive offering. English silverplate on brass hot water jug in a fabulously ornate, Renaissance Revival design featuring a dozen different masks on column separated panels and surrounded by animal, floral and foliate decorations. Two large masks are on either side of the neck and one one the hinged lid. 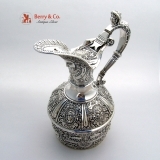 The ornate Caryatid handle with its ivory insulators adds the finishing touch to this special and very usable jug. The flat base of the jug is gilt ans is 3 3/4" in diameter, with the jug being 8 3/8" tall and 7" handle to spout. 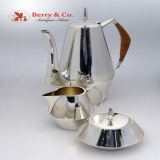 We usually do not have silverplate, but this special jug was just to beautiful to pass up. We believe that you will not disagree. The excellent original condition and clear detail, with no removals, repairs or alterations, make this an especially attractive offering. Thej plating is in excellent condition. The soft, warm, original finish is present, with no buffing or machine polishing. 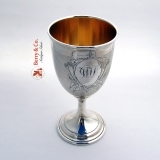 American coin silver goblet having engine turned decorations surrounding an engraved foliate and scroll cartouche containing an ornate, period script monogram: WTD. This handsome goblet is 6 5/8" tall, 3 3/8" in diameter and weighs 168 grams or 5.4 ozs. Troy. Monogrammed as described above, the soft, warm, original finish is present, with no buffing or machine polishing. The excellent original condition and clear detail, with no removals, repairs or alterations, make this an especially attractive offering. American sterling silver and etched glass rectangular decanter with cut corners made by Mauser, c.1890. 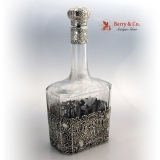 This beautiful decanter is 9 5/8" tall, 4 1/4" long, 2 7/8" wide. The excellent original condition and clear, crisp detail, with no monograms, removals, repairs or alterations, make this an especially attractive offering. Creamer 4 Â½â€ tall, 3â€ in diameter and 4 Â½â€ handle to spout, weighing 245 grams.
. We have a second coffee pot available with a black wrapped Raffia handle that will work well for serving two kinds of coffee. The price is $1500. The soft, warm, original finish is present, with no buffing or machine polishing. The excellent original condition and clear, crisp detail, with no monograms, removals, repairs or alterations, make this an especially attractive offering. 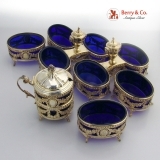 French 950 sterling silver gilt table garniture set consisting of 4 open single salts, 2 open double salts and a mustard pot, each having cobalt glass liners by Pierre Queille, 70 Rue de Fauborg, Montmarte, Paris, 1838 - 1846. Each of these pieces has a frame with floral, foliate and grape garlands, a beaded border and shell and paw feet. The mustard pot has a double row of decorations and a Pomegranate finial. The double salts each have large urn lion mask handles. One of the liners has an edge chip which i not noticeable when in the frame. The frames have their original gilding with a nice, rich patina. The single salts are 3 1/8" long, 2 1/8" wide and 1 7/8" tall. The double salts are the same dimensions as the singles, with a 1 3/4" bridge in between and a handle 3 3/4" tall. The mustard pot is 4 1/2" tall, 2 3/8" in diameter and 3 3/4" across the handle. The silver weight is approximately 563 grams or 18 ozs. Troy and each, save for the mustard pot, is monogrammed, in ornate, period script: VLB. The mustard pot has no monogram. Monogrammed as described above, the soft, warm, original finish is present, with no buffing or machine polishing. The excellent original condition and clear detail, with no removals, repairs or alterations, make this an especially attractive offering. 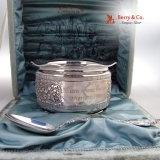 American sterling silver presentation baby bowl in the St Cloud pattern special order by Gorham Silversmiths, date marked for 1888. The presentation box is as spectacular as the bowl. Covered in plush light green velvet and lined in Robin′s egg blue satin, the inside of the lid has a farm scene with a bonneted girl feeding the chickens. The condition of he box is excellent, inside and out. It is 8 1/2" square and 4" tall The spoon, in the Watteau pattern by Durgin, included is a slightly later later addition, with a bonneted girl engraved in the bowl. It goes very well with the general theme of the bowl and box. The bowl has a lightly gilt interior, weighs 350 grams or 11.3 ozs. Troy, is 4 3/4" in diameter and 3" tall. The spoon is 6 7/8" long and weighs 34 grams or 1.1 ozs. Troy. The box, bowl an spoon weigh a total of 954 grams or 2.1 pounds, Avdp. The bottom of the bowl is inscribed: from Walter G. Davis. Inscribed as described above, the soft, warm, original finish is present, with no buffing or machine polishing. The excellent original condition and clear detail, with no removals, repairs or alterations, make this an especially attractive offering. French 950 sterling silver and cut crystal Drageoir (a box for sweets) or Confiturier (Jam container) by Etienne-Auguste Courtois, 62 Rue du Temple, Paris, now in the Marais District. Courtois, a Master Silversmith, who specialized in Partie de Table or important pieces for table decoration, worked from 1834 - 1848, and, as the fineness mark is that used from 1819 - 1838, the piece can be dated 1834 - 1838. The fineness mark, guarantee mark and makerâ€²s mark are on the body and the lid. Even the retaining nut for the lid handle is original. The body of the Drageoir is supported by four panels of winged shell, scroll and acanthus leaf designs, showing off the insert to good effect. The square base has a Gadroon and shell border and sits on four stylized shell caped ball feet, supporting a round, collared pedestal embossed with spear and dart decorations. The lid, which fits the crystal insert properly, has a shell supported ball handle mounted atop a n embossed, alternating leaf and floral cap. The cut crystal insert has lobed panel decorations, the slightest hint of blue color and is free of any chips, flakes or cracks. 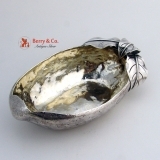 The fancy scroll and shell add the finishing touches to this spectacular serving bowl. The silver weight is 369 grams or 11.9 ozs, with the crystal insert weighing 303 grams. The bowl is 9 1/2" tall, 7 1/8" across the handles, 4 1/2" in diameter a,d 3 5/8" square at its feet. The soft, warm, original finish is present, with no buffing or machine polishing. The excellent original condition and clear, crisp detail, with no monograms, removals, repairs or alterations, make this an especially attractive offering. American coin silver embossed napkin ring with open work, applied twisted rope rims, c.1860. This large, very special napkin ring is 1 7/8" in diameter and 1 1/2" tall, weighing 40 grams or 1.3 ozs Troy. The soft, warm, original finish is present, with no buffing or machine polishing. The excellent original condition and clear detail, with no monograms or removals, repairs or alterations, make this an especially attractive offering. German 800 solid silver octagonal tray with clipped corners, this highly ornate tray depicts court scenes, c.1890. 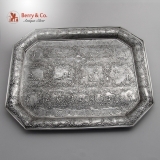 This beautiful tray is 10 3/4" long, 8 3/8" wide and weighs 395 grams or 12.7 ozs Troy. The soft, warm, original finish is present, with no buffing or machine polishing. The excellent original condition and clear detail, with no removals, repairs or alterations, make this an especially attractive offering. American sterling silver Art Nouveau tray in the Love′s Dream pattern by Unger Brothers, c.1900. This beautiful tray is 10 7/8" long, 3 1/8" wide and weighs 96 grams or 3.1 ozs Troy. No monograms or removals, excellent original condition, with some minute dimples in a couple of places. 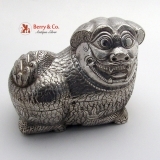 Chinese Export silver figural foo dog large box, c.1890. Unmarked but guaranteed to be as represented. This beautiful box is 6" long, 3 1/2" wide, 4 3/4" tall and weighs 289 grams or 9.3 ozs Troy. The boxes were used to hold the leaves and other ingredients necessary to assemble a quid of betel, a mild stimulant used for centuries throughout Southeast Asia. Because such silver boxes were highly valued by their owners, they were carefully handled and typically remain in good condition. American sterling silver floral Repousse card holder three compartment by Gorham Silversmiths, date marked for 1887. This beautiful card holder is 9 1/2" long, 3 3/4" wide and weighs 342 grams or 11 ozs Troy. The excellent original condition and clear, crisp detail, with no monograms, removals, repairs or alterations, make this an especially attractive offering. The soft, warm, original antique finish is present, with no buffing or machine polishing. 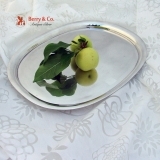 American Aesthetic sterling silver olive dish in the form of a hollowed out olive by Gorham Silversmiths, date marked for 1887. This wonderfully naturalistic dish has a gilt interior and applied olive leaves and is 5 3/4" long; 2 3/4" wide; 1 1/4" deep and weighs 149 grams or 4.8 ozs. Troy. The excellent original condition and clear, crisp detail, with no monograms, removals, repairs or alterations, make this an especially attractive offering. The soft, warm, original antique finish is present, with no buffing or machine polishing. American sterling silver set of 6 hand made salt dishes by Joel R. Hewes, of Titusville, PA, in the arts and crafts style, c.1925. These handsome dishes with seven lobes and averted rims are 2 5/8 inches in diameter, 1/2 inches tall and weigh a total of 211 grams or 6.8 ozs Troy. The excellent original condition and clear, crisp detail, with no monograms, removals, repairs or alterations, make this an especially attractive offering. The soft, warm, original antique finish is present, with no buffing or machine polishing. 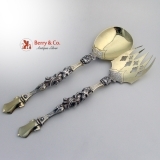 English sterling silver salad serving set in a Gothic style with figural handles by Charles Edwards, London 1879. This magnificent set is 11 1/4" long and weighs a total of 280 grams or 9 ozs Troy. The excellent original condition and clear, crisp detail, with no monograms, removals, repairs or alterations, make this an especially attractive offering. The soft, warm, original antique finish is present, with no buffing or machine polishing.